Some might say that calculation is one of the most important skills in chess. For sure it is an important skill. But there is at least one skill even more important. If we think for a moment about it, it is completely obvious. I found this puzzle on chess tempo (like a lot of others). 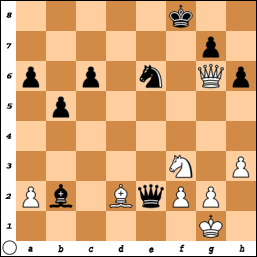 I am not completely sure what was white’s last move. But I guess it was a move with the bishop. So lets say from the diagram white played 1. Bd7. 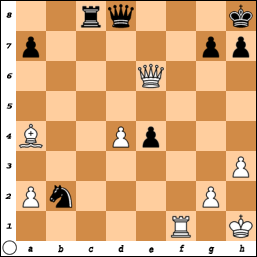 It seems to make sense because the bishop attacks the black rook and in doing so this poses a problem for black. How should he respond? Certainly not the way he did with 1. … Rc7? After this move white has a nice finish. More tenacious would have been either 1. … Rb8 or 1. … Ra8. You see in the analysis why. As it happens more often, I went for the wrong solution. After 1. Bd7 Rc7 I played a rather obvious move and missed a clever defense for black. 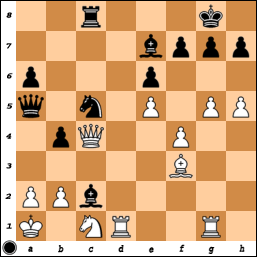 See my remarks with white’s second move in the analysis*. So the question is: how can white win? Pfff… (here in Sweden we might say oj, oj, oj and in Dutch oei, oei, oei) that was long time ago since I wrote something on this blog. My apologies! I will behave like a good kid and write something more in the near future.